It was a real honour to have a chance to co-present a show leading off the second incarnation of the wonderful TONE Festival. Even if there can be unexpected shifts in a lineup from planning to execution, I was very excited with the night that came together. I was also excited to bring this project from Kurt Newman to the Baby G's big stage + sound system — though I confess at first I assumed that I would get something like the feedback'n'molasses I'd seen previously. 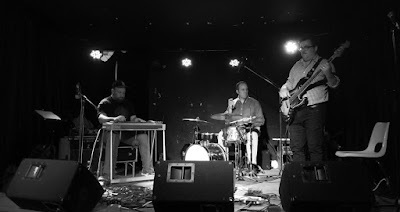 The fact that (minimalism be damned) this emerged as a trio was all the more exciting, with Mike Smith (bass) and Nick Fraser (drums) dropping in like a local version of the Wrecking Crew and executing some theoretically simple rhythms with grace and imaginative finesse. Newman had jokingly threatened some "Dukes of Hazzard car chase music" and from that seed of an idea in this piece, they'd speed things up into a chugging train rhythm and slow it down to a relaxed waltz (with some especially-beautiful lyrical playing from Newman) before hinting at possibilities for escape velocity in a closing piece that brought back a bit of that feedback I'd originally associated with this project as well as a guest turn from Karen Ng on sax. * Thanks to Kurt for passing along the title to this one! Joe, thanks so much! This tune is called "A Dime's Worth of Sunshine."